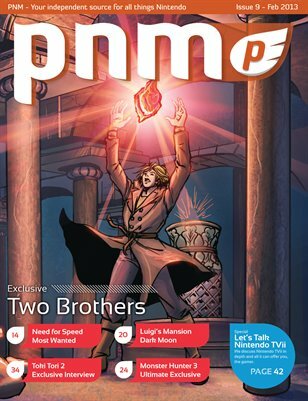 Pure Nintendo Magazine Issue #9 is our biggest and best issue to date! We have the exclusive first preview at Ackk Studios' Two Brothers on the Wii U, an exclusive interview with the Producer of the Monster Hunter series (specifically Monster Hunter 3 Ultimate for Wii U and 3DS), and an exclusive with the Toki Tori 2 team. Our issue wouldn't be complete without an inside look at the recently released Hyrule Historia. We discuss the Zelda timeline in depth and also include 8 pages directly from the Hyrule Historia including an exclusive look at the Zelda comic. We also preview several games including Need for Speed Most Wanted (Wii U), Luigi's Mansion: Dark Moon (3DS), and Castlevania: Lords of Shadow - Mirror of Fate (3DS). Huge thank you to all the developers at Capcom, AckkStudios, Two Tribes, and EA for their exclusives in the magazine.